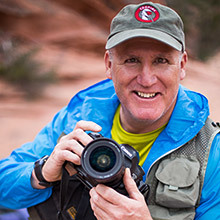 Michael DeYoung is a Taos, New Mexico based adventure sports and landscape photographer. So my life progression is pretty much this: hyperactive kid, Eagle Scout, Air Force meteorologist, pro photographer. Given a choice my ideal vacation would be one of physical effort and enlightenment in an awe-inspiring location. Himalaya trekking tops the list while laying on the beach in Cancun will never be on the radar. I think this says a lot about who we are (wife Lauri and I) . We live off grid with solar power, passive solar heat and rain catchment. While I don’t drink coffee I do need my morning dark chocolate, 90% preferably, to get me going. Our world is the outdoors and we like it all: desert, mountain, forest and water. While adventuring in remote corners of the world is cool, so is exploring close to home and we do that regularly. Not all of our pursuits need to be an adrenaline rush or an expedition. We like day trips too. As long as it is human powered fitness, recreation or adventure sports and their related lifestyles and surrounding landscapes then it’s all good! Bottom line is: if it’s outside, we’re in! Alaska was home for 18 years but we’ve been romping around up there for 25. On all of our assignments and wilderness adventures our bear encounters have all been good. Not so with insects. I’ve endured thousands of mosquito bites and a dozen bee and wasp stings. Bugs and all, Alaska is still the most awesome place ever. Home is now northern New Mexico at 7,400’: Fewer mosquitoes, less oxygen, longer paddling season, and great skiing. My style of clean, colorful imagery often with lots of soothing space comes from a combination of outdoor life and professional experiences. Meteorology and its effects on light, knowledge of many things outdoors, a little wilderness guiding, independent foreign travel, workshop teaching, art directing and production all contribute to what you see in my imagery.